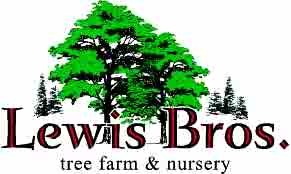 Get the healthy maple trees you want with the delivery and planting services you deserve with Lewis Brothers Tree Farm & Nursery today! The perfect shade option for our climate. 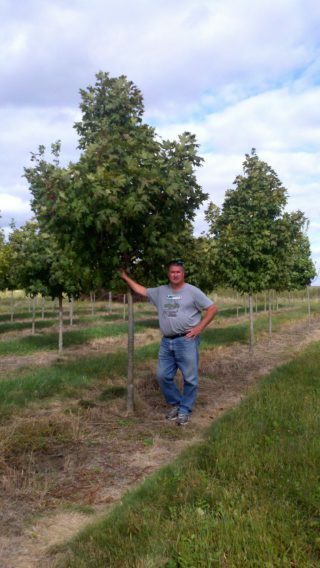 Chose from our extensive variety of medium to large maple trees. Our nursery is open by appointment. Just give us a call and let us know when your coming. 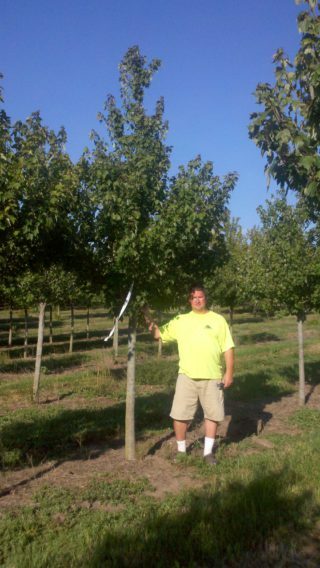 Our friendly professionals are eager to show you around our inventory of over 5,000 healthy trees. Your tree purchase comes with free delivery. Planting services are also available, and so is a 1 year warranty when planted by our experienced staff. Put our Excellent survival rate to work for you! 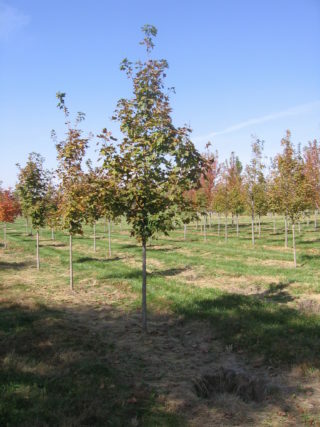 If you want a large, fast growing tree with spectacular fall color, the Autumn Blaze Maple is an excellent choice. A hybrid of the Red and Silver Maple it possesses the vigor and adaptability of the Silver with the beauty and strength of the Red Maple. Ascending branch structure with a strong central leader. More open canopy than the Red Sunset or rubrum variety. The Commemoration Sugar Maple is a vigorous, fast-growing tree. At maturity the tree reaches 50′ in height with a 35′ spread. The oval-rounded canopy is dense with heavy textured Dark Green Leaves turning to Yellow-Orange-Red in fall. Possibly the most widely used Norway cultivar, introduced in 1962, the Emerald Queen Norway Maple has an upright rounded crown centered on a straight trunk. Lateral branches grow upright while the tree is young which minimizes the pruning requirement. The Emerald Queen provides dense shade and it’s glossy green foliage turns to a brilliant yellow fall color unmatched by most trees. A hybrid, the Green Mountain Sugar Maple has a Dark Green leathery foliage that turns Orange to Scarlet in the fall. Yellow to Red fall foliage has also been reported. Quite heat tolerant and performs better than species in dry, restricted growing areas. The thicker leaf has good resistance to scorch. The Acer x freemanii belongs in the hybrid group between the Red Maple (Acer rubrum) and the Silver Maple (Acer saccharinum). These species have been chosen for the autumn color, growth rate, and habit. The Marmo is an upright, columnar tree with leaves that turn from a medium green, silver-grey underside to a bright orange-yellow in the fall. The October Glory tends to hold it’s lustrous green leaves late into the fall. The intensity of the brilliant orange to red fall color, if the freeze holds off, can last 3 to 4 weeks, thus holding their fall color longer than most other deciduous trees. Commonly used as a landscape tree, as well as lining streets and driveways. One of the best Maple cultivars, excellent orange to red fall color. The Red Sunset Maple is considered one of the best trees for early fall color. A larger deciduous tree that has a pyramidal form when young becoming rounded with age. The tree grows rapidly and has a dense canopy in the sun, but opens up in partial shade. Develops good branch angles. Bright red fall color. The Red Rocket is a release from the US National Arboretum. Selected from seedlings from a northern Minnesota source, it is a very hardy Red Maple cultivar. 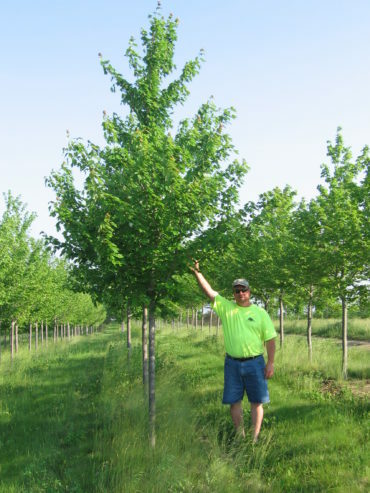 It’s shorter height and narrow growth pattern makes it an excellent tree for smaller areas. Although from northern sources, it is reported that the Red Rocket is more vigorous and uniform in southern climates. The Sun Valley Maple is a cross of Acer rubrum ‘Red Sunset’ and Acer rubrum ‘Autumn Flame’. 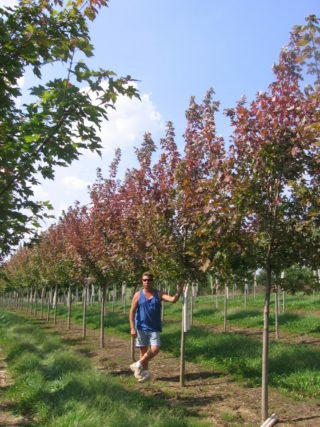 This Red Maple cultivar has exceptional, long lasting Red fall color. Red-Purple, Peach-Orange-Red colors have also been seen. Excellent for lawn, street, highway or park planting and as a shade tree for residential sites.